rather than being forced to travel long distances. Photo by Chenayi Kumuterera, UMNS. Hanwa Mission School, a project of the Community UMC of Crofton, is now officially a United Methodist school. In March, the Murewa Rural District Council transferred the primary and secondary school to the Zimbabwe United Methodist Church for further expansion to benefit the local community. As a registered United Methodist school, Hanwa can offer exams to the students who previously had to travel long distances for testing. The designation also means that Hanwa can be developed into a boarding school. Plans are for that work to begin in 2020, said the Rev. Solomon Mawoyo, Zimbabwe West education secretary. “But with the economy, we surrender all to Christ,” he said. The campus covers about 100 acres and includes a large dam for irrigation. 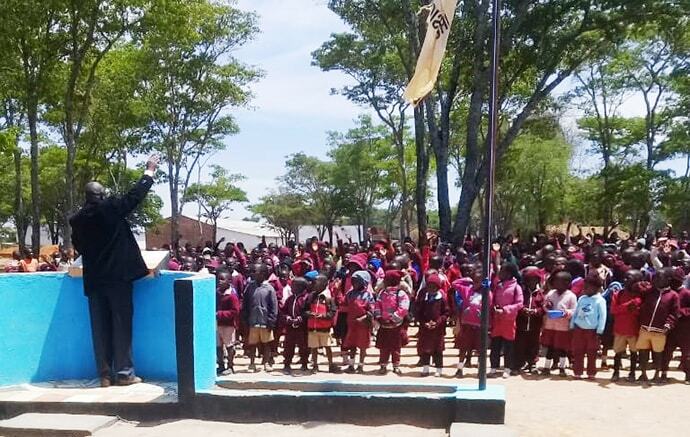 The three primary and two secondary classroom blocks were constructed through a partnership with the Baltimore-Washington Conference Zimbabwe Volunteers in Mission. The district council established and registered the Hanwa Mission School in 2000 during the land-reform program. Newly resettled villagers and the district council said a school was needed because of increased population and the long distances children would travel to existing schools. In 2005, when the community, school leaders and the district council realized they could not sustain school operations and development, the Zimbabwe West Conference was invited to take over those responsibilities. However, the official registration and handover was delayed for many years due to missing paperwork. Before, Nyambo said, during exam periods, children had to walk more than six miles to Macheke and Nyazira to take their tests. “It is not unusual for young women who lack bus fare to be sexually harassed by the bus drivers,” he said. The students also would often ride in open trucks because it is the cheapest mode of transportation. “This movement,” Nyambo said, “is not good for the children. Some end up dropping out of school because there is nothing that motivates them. “We are expecting excellent results (with the exam change), because the students will be familiar with their school setup,” he said. He said the decade-long partnership with the mission and Zimbabwe Episcopal Area has changed many lives over the years. In February, the collaboration led to the opening of a state-of-the-art early childhood development center and playground at Hanwa Mission School. Hilda Chikata, a parent and farmer, said the handover creates new opportunities for students and the community. “I am pleased that … we are going to have a better school. I and other parents in the community will supply the school with vegetables and earn a living,” she said. Student Tinotenda Kadiramwando, 10, said he is looking forward to being able to take exams at his own school. Lindiwe Mupanduki, Hanwa Secondary School head, said the transfer from the council to the church allows full application of United Methodist Church school policies. Kumuterera is a communicator with the Zimbabwe West Conference. This story courtesy of United Methodist News Service. Is there a means to which we can send monetary donations to this cause?